okay, so some of you know i call my children noisemakers...i've also given names to objects around my house. 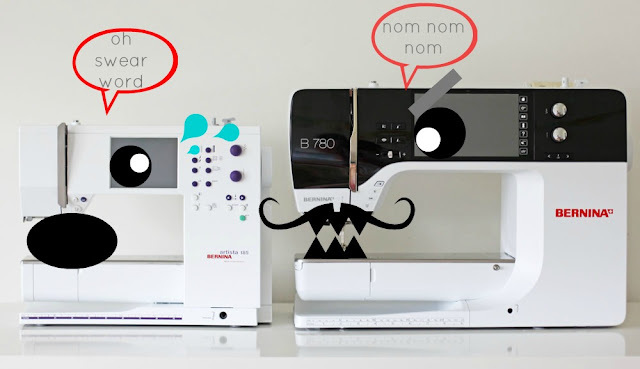 like i've named my serger (whom i still have a tumultuous relationship with) Sergio. (but you have say the "gio" with a lot of flemy throat action) you know that i named my sewing machine "betty" because she's so cute and basically my best friend...well we hang out almost every day for hours on end so yeah, best friend status is in order, and you know that my car's name is steve. oh wait, no, you don't know that do you. yeah, my car is named steve, and my husband's car is brenda. they have a relationship...but that's for another post i guess. sooooo, why do i tell you these things? well because i'd like to introduce you to the "BEAST"
oh no, NO! really it's not a bad thing why i call her that. hello look at her! she's like a tank compared to my little betty. i mean hello, that lady has some testosterone enough to grow a mustache. BEAST: i can squash you if i want to. 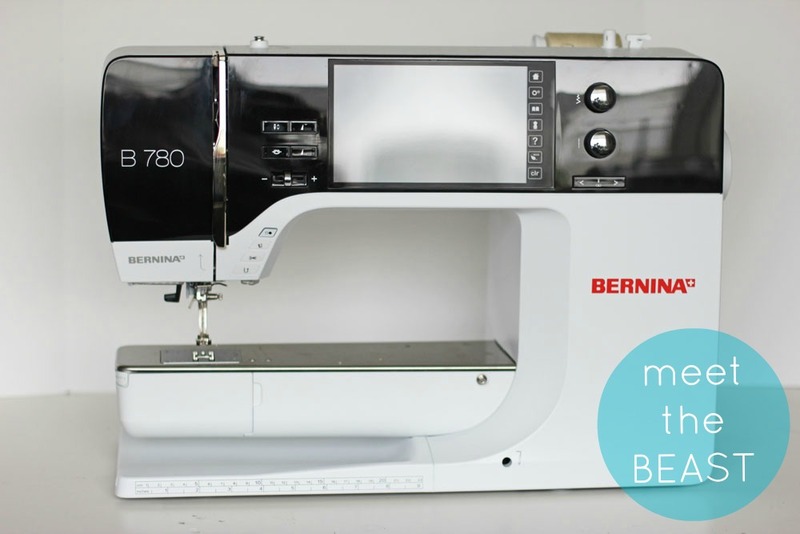 i can eat cute little bernina's like you for breakfast! yeah, she's a beautiful beast, and, yes, for two weeks i get to play with her. you've already seen my spiderweb table runner i made with her, but that's nothing compared to what she can do. help me learn some of the cool features on this amazing Beast. 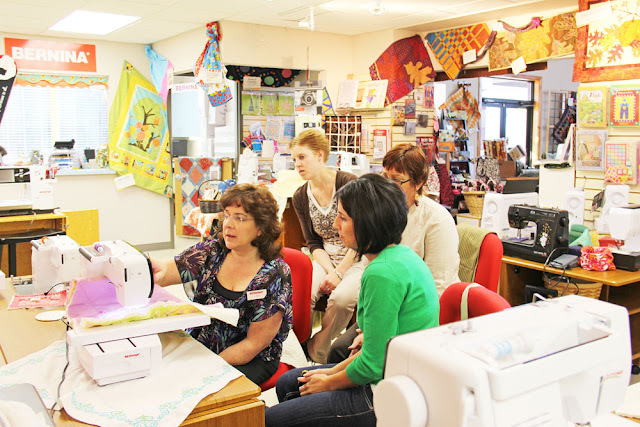 here we have lisa teaching us about the embroidery section on the 780. look how studios we all look. it's like blowing our minds. also from this angle i look just like my mom. holy crap. so for the next few weeks it's my turn to be the celebrity sewer to work with the 780. you'll see me pipe in here with cool new things i've learned about this machine. we'll try to give that a go. LOL! Love the pic of Betty and the beast! Oh goodness. I'm afraid that would be too much temptation for me. To get to play on that Beast and then have to give it back? Eep! that is too funny. I named my stand mixer betty! Lucky you !! and I did not get the size until you put big moustache near little softy betty....waou, it is huuuge !!! Bahahaha! We had a Brazilian exchange student in our department in college and his name was Sergio. He was a hoot. And not in a cute way, but in a awkward, obnoxious way. We all thought it was hilarious when he ended up on the America's Got Talent audition episodes. True story! Man your graphic is hilarious. LOL Have fun with the Beast! Lucky you! This post is really funny. Thanks! I name everything, too. My machine is Oscar, and my laptop is Argyle, my phone is Giles, etc. I've had to quit naming cars, though, since it appears to hasten their demise. My nameless car has lasted for six-seven years sans accident or major mechanical issue…. fingers crossed! Good luck with Beast - hope it doesn't treat you so well, you'll be crushed to give it back! If you decide to "not" give the beast back, Bertha would be a great name. betty and the beast...sounds like an elton john hit song! I love the way you write! Your graphic made me laugh out loud! Enjoy the beast! I can't wait to see what you do! I love your graphic. It's still making me chuckle. 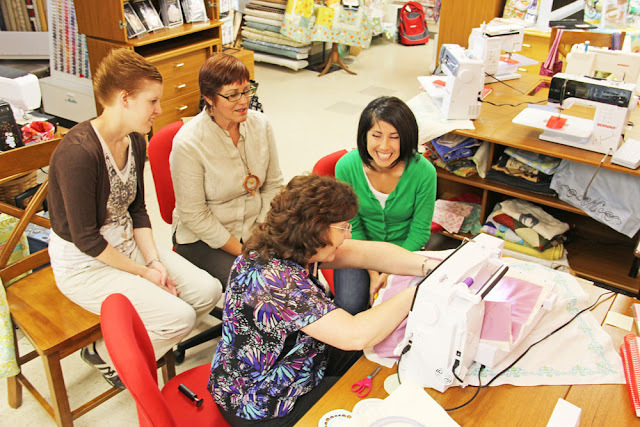 When I went to a sewing class recently, the ladies teaching all referred to their machines as females also. That seems odd to me. In my quirky mind, my sewing machine is male. The one before was male as well. But this one is a Viking. And vikings are all male in my head apparently. Plus, I really enjoy telling my hubby that I'm gonna go play with Thor. I'm glad you're enjoying the Beast! 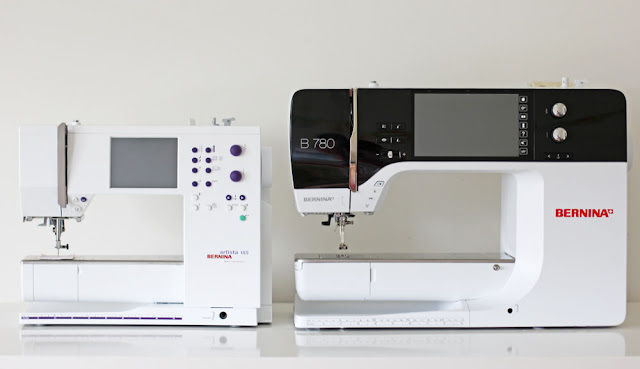 I went in to test drive the 820 and decided it was too intimidating for me (I use a 1978 Singer, her name is Marsha Sue) Today I ordered the 750QE without embroidery, and I'm sooo excited! Her name is going to be Bridget. It's going to be a big learning curve, but I'm really psyched! Adorei os nomes,só chamo minha lavadora de Clara...Beijo. Wow that is one big machine lucky you! Your photo is so funny as well. I missed seeing you at SS this year it was a fun time. Oh no! My name is Brenda, and my EX husband's name was Steve. Oh so cool. I drive by that store all the time. Love all the gorgeous fabric. YOu are so lucky! My borrowed 1980 Kenmore has been breaking down (finally), and Monday I hope to have time to visit my local Bernina dealer. 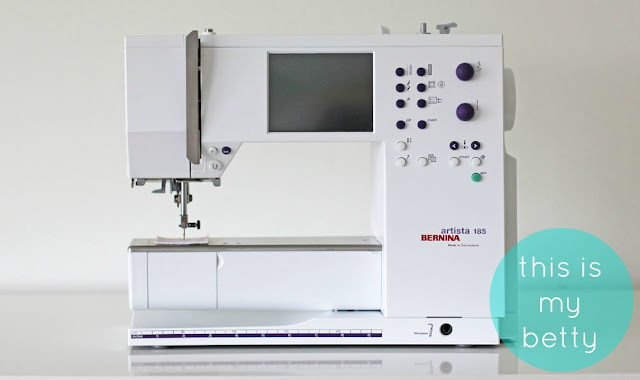 I just bought a 705QE without embroidery and love it!!! I have named her "Nina"; she shares my sewing room with a Babylock Ellisimo whose name is "Ellie. "Naming things we love makes life interesting, don't you think.